Chief Executive Officer, Medical Mutual Holdings, Inc.
Dale Jenkins is the Chief Executive Officer of Medical Mutual Holdings. Founded in 1975, the Group’s flagship company is Medical Mutual Insurance Company of North Carolina, a property/casualty insurance company that specializes in writing professional liability insurance for physicians and healthcare professionals. Additionally, the company owns MMIC Investment Holdings, which possesses various real estate properties and private equity investments. 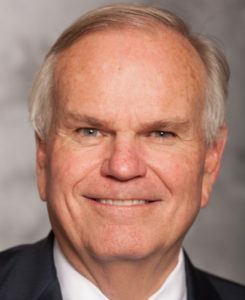 Currently, Dale serves as the Chairman of the Board for The University of North Carolina Health Care System and Capital Associated Industries. He is the immediate past chair of the NC Chamber. Prior to joining Medical Mutual in April 1994, Dale spent 16 years with Ernst & Young. He held various positions at Ernst & Young from July 1978 – September 1987 before becoming a Partner in October 1987. Dale graduated from Wake Forest University in 1978 with a Bachelor of Science degree in Accounting. He earned his Certified Public Accountant license in 1980.